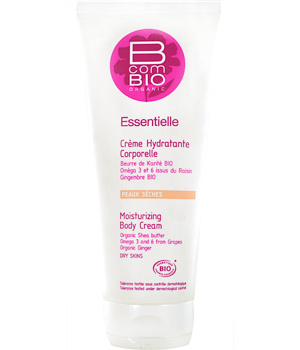 Complete daily care for the body, to moisturise, nourish and firm the skin. Rich texture. Organic Shea Butter, obtained through fair trade: Nourishes, repairs and softens the skin. Omega 3 and Omega 6 (essential fatty acids from grape seeds): Moisturise deep down and repair the epidermal layers of the skin. Organic Ginger extract: Firms and gives new life to the epidermal layers of the skin. Organic Hazelnut Oil, Organic Sunflower Oil, Squalane extracted from olive oil: Nourish, moisturise and protect. Results: The skin is perfectly moisturised and protected. The skin is firmed and toned again. The skin feels extremely comfortable, supple and soft. The BcomBIO cosmetic care products are made with 95 to 99% natural active agents, thus complying with the Organic Cosmetics' guidelines. Our Sicobel laboratory adheres to the One Voice charter, and commits itself not to carry out any test on animals. Active ingredients from plants, the performance of a dermocosmetic laboratory, and always more innovative care products for the beauty and respect of your skin, are the essence of our brands. -The culture of organic raw materials doesn't use any synthetic fertiliser or pesticides. -The raw materials used are natural and biodegradable. -The making of organic cosmetics respects the environment (ex: the cleaning products used are regulated to limit pollution). BcomBIO's specificity: 90% of products do not have an exterior case (limited used of ink, less waste, protection of the forests). In an ordinary cosmetic product, a great number of ingredients are used only to colour, perfume or change the texture... In an organic cosmetic, all the ingredients used have beneficial effects on the skin. -Active ingredients, the substances responsible for the product's effectiveness. -Excipients, which give "texture" to the product and help the diffusion of the active agents into the skin. -Additives, which represent a wide range of preservatives, fragrances and dyes. Use : Apply morning and/or evening to the entire body after washing, insisting on dry areas and areas that lack firmness.